A new image from NASA's Chandra X-ray Observatory and Spitzer Space Telescope shows the dusty remains of a collapsed star. The composite image of G54.1+0.3 shows X-rays from Chandra in blue, and data from Spitzer in green (shorter wavelength infrared) and red-yellow (longer wavelength infrared). Scientists think that a pulsar (the white source in the center) is sending off a wind that is heating up remnant supernova dust. The dusty remains of a collapsed star can be seen flyingpast and engulfing a nearby family of stars in new images from NASA's Chandraand Spitzer space telescopes. The composite view of the stellar remains (dubbed, "G54.1+0.3")includes observations from the Chandra X-ray Observatory in blue, with greenand red-yellow regions studied by the Spitzer Space Telescope. 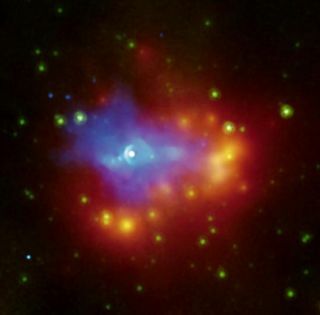 The white sourcenear the center of the image is a dense, rapidly rotating neutron star, or"pulsar,"left behind after a core-collapse supernova explosion. The pulsar generates a wind of high-energy particles ? seenin the Chandraphotos ? that expands into the surrounding environment, illuminating thematerial ejected in the supernova explosion. The infrared shell that surrounds the pulsar wind is made upof gas and dust that condensed out of debris from the supernova. As the colddust expands into the surroundings, it is heated and lit up by the stars in thecluster so that it is observable in the infrared. The dust closest to the starsis the hottest and is seen to glow in yellow in the image. Some of the dust is also being heated by the expandingpulsar wind as it overtakes the material in the shell. The unique environment into which this supernovaexploded makes it possible for astronomers to observe the condensed dust fromthe supernova that is usually too cold to emit in the infrared. Without thepresence of the stellar cluster, it would not be possible to observe this dustuntil it becomes energized and heated by a shock wave from the supernova. However, the very action of such shock heating would destroymany of the smaller dust particles. In G54.1+0.3, astronomers are observingpristine dust before any such destruction. The nature and quantity of dust produced in supernovaexplosions is a long-standing mystery, and G54.1+0.3 supplies an importantpiece to the puzzle.